On Oct. 31, Morocco's allies on the United Nations Security Council — including France, the United States, and Britain — blocked a motion to condemn human rights abuses against the people of occupied Western Sahara. Despite reports of Morocco's escalating repression of the Saharawi independence movement, the resolution passed by the Security Council merely extended the mandate of the United Nations Mission for the Referendum in Western Sahara (MINURSO), a 15-year-old "peacekeeping" mission that has failed to facilitate a referendum on self determination. Earlier that month, Moroccan officials rejected as "biased" and "completely erroneous" a report from the office of the U.N. High Commissioner for Human Rights that revealed the use of torture and violent repression against pro-independence demonstrations and activists. According to Afrol News, the report exposed the regular denial of rights to a fair trial, freedom of expression, and freedom of association in Western Sahara. On Oct. 30, 80 people were apprehended by Moroccan police at a ceremony in El-Ayoun marking the anniversary of the death of Hambi Lembarki. Lembarki was an activist beaten to death by police during a pro-independence demonstration last year. His death is among the few incidents of repression that have reached the courts. On Oct. 24 the Switzerland-based Association for a Free and Fair Referendum in Western Sahara reported: "The repression seems to be principally directed against young people, of which a great number have been arrested, stripped and beaten, violated with various instruments, forced to swallow diverse substances, subjected to injections with unknown products and to diverse forms of torture." Kamal Fadel, the representative in Australia of the Saharawi liberation front (Polisario), spoke to Green Left Weekly following the Security Council's refusal to take a stand against Morocco's human rights abuses. He said that the council "had in front of it a report that stated clearly that there is a problem with human rights abuses in the occupied territories of Western Sahara." France objected to any mention of the human rights situation in the Security Council resolution. "There has been an increase in action by the people of Western Sahara. The current uprising has continued for over a year now, during which time there has been an increase of vocal disagreement with the presence of Morocco in Western Sahara. The response from Morocco has been very harsh — using torture, imprisonment, and kidnappings to repress the uprising," Fadel said. The passage extension of MINURSO's mandate was welcomed by Washington, which has backed Morocco's occupation of the mineral-rich territory since its 1975 invasion. According to an Oct. 31 Washington Post article, William Brencick, a senior U.S. diplomat, said: "The United States remains concerned that the Western Sahara conflict has impeded regional integration and development for the last 30 years. A lasting resolution is now long overdue." However, Brencick's comments in favor of an "autonomy proposal" indicate support only for a "resolution" in Morocco's interest. The autonomy proposal is a referendum model proposed by Morocco that would include an option of regional autonomy for Western Sahara, but would deny a vote on independence for what it calls its "southern provinces." Morocco welcomed the extension of the MINURSO, confident it will remain powerless to force a referendum that could lead to Saharawi independence. In a statement reported in Johannesburg's Sunday Times on Nov. 2, the Ministry of Foreign Affairs "hailed" the resolution, saying it "completely reinforces the approach supported by Morocco for a lasting political solution." Since Morocco and Polisario agreed to a ceasefire in 1991, the Moroccan government has prevented a referendum (a condition of the ceasefire) from taking place by obstructing updating of the electoral roll, and has continued to deny a vote on independence. Commenting on Morocco's referendum model, Fadel said: "In our view a solution that does not involve a democratic and fair referendum will not be a solution at all — it will be a fake solution. A referendum that does not offer a chance for self-determination will not succeed because it will not be accepted by the Saharawi people or the Polisario front as their legitimate representative. "Our only demand is that the people of Western Sahara are given a chance to exercise their legitimate right to a referendum that contains the option of independence. We do not object to the referendum including an option of Western Saharan integration into Morocco. "This is a compromise we are making. But [Morocco] is adamant in its intransigent position as it fears a democratic solution, which will likely culminate in independence for Western Sahara." According to a Nov. 6 Reuters report, Morocco's King Mohammed VI, in an attempt to build support for his country's anti-democratic position, argued that an independent Western Sahara would harbor terrorists: "This dreadful hypothesis would transform the North African region into a dirty marsh and den of terrorist gangs and criminal bandits smuggling human beings and arms." "These are the hazards Morocco is striving to prevent by proposing the autonomy within the framework of a great drive of democracy Morocco has embraced," he added. While independence is not on the agenda of Morocco or its allies, there is support among the Western powers for "progress" toward some form of resolution during the current six-month term of MINURSO. According to Yahia Zoubir, author of "The United States and the North African Imbroglio" (Mediterranean Politics, July 2005), the Western Sahara question is seen by the U.S. as an obstacle to establishing a regional trade bloc that includes Morocco and Algeria and developing north African unity in the 'war on terror.' "
Algeria has been a longstanding ally of the Polisario front, providing refuge to Saharawis who have fled Morocco's invasion and financial support to the independence movement. Camps in southern Algeria are home to more than 160,000 displaced Saharawis and are the base for Western Sahara's "government in exile," the Saharan Arab Democratic Republic (S.A.D.R.). On the other side of the conflict, the U.S. has been a longstanding ally of Morocco. Between 1950 and 1998, Morocco received more U.S. aid than any other Arab or African country, except for Egypt, receiving more than one-fifth of all U.S. aid to Africa. 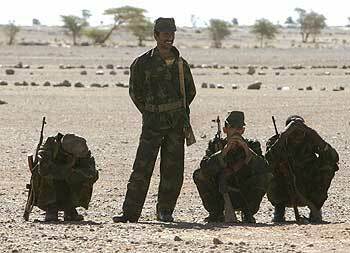 Without U.S. counterinsurgency support, Polisario would likely have succeeded in forcing out Western Sahara's occupiers. In 1981, the armed movement had liberated the vast majority of Western Sahara and had forced out Mauritanian forces that had participated in the 1975 invasion. But within six years, Morocco had re-conquered almost the entire country, following a boost in military aid from the Reagan administration. Using a U.S.-designed 1,500-kilometer sand wall, lined with an estimated three million landmines, Moroccan forces managed to isolate Polisario to a third of Western Sahara, along its eastern border. Similar support for Morocco has been provided by European powers, such as France, throughout the occupation. On Oct. 10, the European Parliament voted on an agreement with Morocco that will allow European boats to fish in the occupied territorial waters of Western Sahara. As well as Morocco's plundering of Western Sahara's large phosphate resources, plans are underway to extract oil and natural gas from offshore reserves, with the Moroccan government granting U.S. corporation Kerr-McGee exploration rights in 2001 to 27 million acres of offshore territory. International solidarity campaigns have in recent years forced other companies to withdraw from similar contracts. The invasion of Western Sahara by Morocco and neighboring Mauritania took place as Spain was moving to end its 90-year occupation, which had been weakened by a growing independence movement. In 1975, the International Court of Justice rejected Morocco's claim to Western Sahara. At the same time, Morocco and Mauritania signed a secret agreement with Spain for a handover of the territory. Morocco's King Hassan II, who was facing a domestic crisis at the time, ordered the "green march," a contingent of 350,000 civilians aimed at seizing Western Sahara. The corporate media portrayed the events as a crusade by an oppressed nation against the Franco government, turning a blind eye to demonstrations of thousands of Saharawis against the Moroccan-Mauritanian takeover. Since then, the government has promoted Moroccan settlement in Western Sahara by providing subsidies on goods, services, and incomes. Despite this, a large proportion of the Moroccan population in the region is some 140,000 occupying troops. When U.N. Secretary General Kofi Annan told Polisario on Oct. 18 that they should drop their demand for a referendum with independence as an option and reopen negotiations with Morocco, Boukhari Ahmed, the representative of the Polisario Front to the U.N., responded in an interview with the Sahara Press Service by saying that "it is necessary now, not to resume negotiations, but to implement the signed accords." S.A.D.R. President Mohamed Abdelaziz said on Nov. 4: "Meanwhile, we will continue the intifada in the occupied territories and create pressures on the Moroccan government to compel it to respect the fundamental freedoms in the zones of the territory it occupies, without abandoning the possibility of resuming war once all efforts failed." Commenting on the possibility of renewed armed struggle by Polisario, Fadel said, "I think all options for winning independence remain on the table. There has been a ceasefire since 1991, but it was a ceasefire based on the promise of a referendum for self-determination in [January] 1992." Fadel pointed out that the Saharawi people have made a series of compromises, but Morocco, backed by powerful world leaders, has been unwilling to reciprocate: "In the past, France, in the name of human rights, backed calls for the release of Moroccan prisoners by the Polisario. We have cooperated and respected the call by freeing the Moroccan prisoners of war. But despite this, our country continues to suffer from repression by Moroccan forces, including the repression of peaceful demonstrations. But that has not stopped or deterred the Saharawi people, who have shown great courage in their defiance to the occupiers." "If U.N. efforts fail, the people of Western Sahara will have all options available, continued uprising in the occupied territory, and other means [may be] possible. This is the legitimate right of the people of Western Sahara to seek their rights by whatever means they choose." Fadel explained.